This has been another big year in the history of our University, marked by us being shortlisted for the Times Higher Education University of the Year. It was a huge achievement for us to make the shortlist and testament to the excellent work of our staff and students in making Winchester an outstanding institution. We have a bold and distinctive vision to provide world-leading, values-driven higher education: this means everything we do is built upon our deep commitment to our values and aims to make a real difference in the world. This is our first annual report taking steps towards aligning with the International Integrated Reporting Framework, which describes our integrated thinking and how we combine our capitals to generate value. We are all excited about this new approach, bringing together the numerous ways we add value to our students and the communities we serve. You will see evidence of our impact and the business excellence that underpins it, as reflected in our healthy financial performance. However, the Higher Education sector continues to be operating in a climate of political uncertainty. In February 2018, the Prime Minister announced a major review of post-18 education and funding which is due to conclude in early 2019 and the ongoing negotiations on the exit of the UK from the European Union continue. Against a backdrop of decline across many higher education institutions, we continue to grow our undergraduate student recruitment. The University is in a strong, financially sustainable position, as we enter a new chapter of political and financial uncertainty in the Higher Education sector. We have grown and enhanced our academic portfolio, extended our partnerships in the UK and across the globe, and continue to invest in our students’ experience, academic endeavours and capital infrastructure. In particular, in January 2018 we started work on our largest campus development in the 178 year history of the University. This £48m teaching and learning building in the heart of our West Downs Quarter will be a significant and impressive addition to our campus and will be home to our digital futures courses. We pride ourselves on being a university that goes above and beyond in widening access, and we will continue to invest in widening participation, including £2.9m in non-repayable fellowships, bursaries, scholarships and prizes to support our students. We are sector leading in supporting young people who are traditionally less likely to enter higher education, particularly young carers and children from military families. I hope that as you read this report, you will get a strong sense of our passion for outstanding education and research underpinned by our strongly rooted values and business excellence. The financial statements reflect another successful year of growth, whilst the sector continues to contract overall. We have bucked the trend of the demographic downturn and grown in undergraduate student recruitment, enhanced our academic partnerships in the UK and across the globe and invested in our students’ experience, academic endeavours and capital infrastructure. Together with robust cost control, we have mitigated the future freezing of UK tuition fees, rising staff costs and, in particular, pension cost increases. The University receives income from many sources including tuition fees, Government funding, research grants as well as income from our accommodation and catering services. Our income is used to fund our day-to-day activities including the provision of teaching and support for our students and to fund our research activities. It also funds the running of our four faculties and the additional services our students are able to access such as the library, learning resource centres, sports facilities, dance studios and computer labs. We also receive funding through the Government led Research Excellence Framework which allows us to offer a diverse portfolio of Post Graduate research opportunities. We put our students at the heart of everything we do, including how we spend our money. 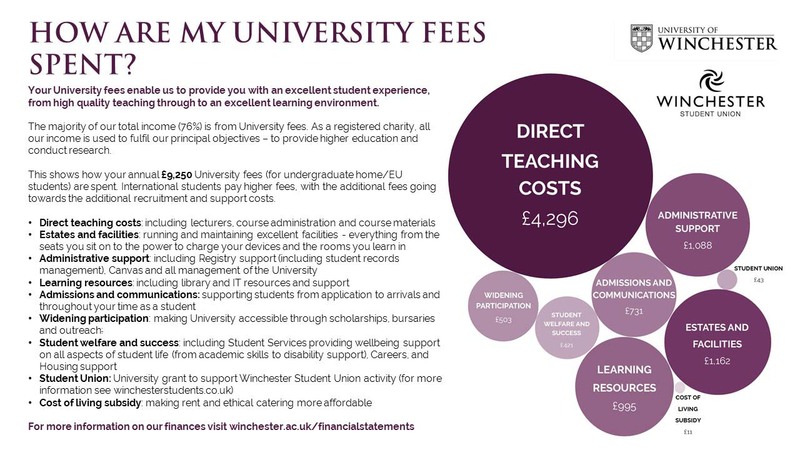 The single largest cost to the University is the cost of providing excellent teaching and learning for both undergraduate and postgraduate study. We also spend money on providing our ethical and sustainable catering across campus, outstanding accommodation for our students and supporting the Student Union with an annual maintenance grant. As well as our day-to-day operating expenditure we also invest heavily to maintain our estates and ensure we have the best, most sustainable estate possible in the future. The University contributes over £266 million a year to the regional business community, outlined in the Economic Value of the University of Winchester, a report launched in June 2018. How are my tuition fees spent? Tuition fees are a key part of the funding we use to deliver an outstanding student experience. Our income, including tuition fees, is used to support the delivery of our of courses, to provide the excellent infrastructure and facilities we offer and to provide a world-class learning environment. These funds enable us to continue to provide an outstanding environment for our students and staff to ensure we remain financially sustainable in the long-term and able to invest in the future success of the University. Tuition fees make-up around two-thirds of our total income and is just one of the many sources of income. Research grants, government funding and income from halls, catering and business partnerships also contribute to our overall income. What are you doing to divest into green, ethical funds? We hold people, the planet, and all living things in the highest regard. Our strategic plan commits us to reducing our environmental impact and improving sustainability in everything that we do. The Ethical Investment Policy governs how the University invests its surplus funds, including how it ensures that investments are diversified, financially safe, ethical and compliment the University’s values. To date we have divested £5mil into the Nationwide Building Society which is recognised as a green, ethical fund by the Ethical Investment Research and Information Service Foundation. The divested funds include all of our endowment funds. We will continue to review our financial management, in light of the Ethical Investment Policy, as funds on long-term deposits mature for reinvestment. How can we see your Financial Statements?